Acknowledged author Michael T. Madigan wrote Brock Biology of Microorganisms comprising 1056 pages back in 2017. Textbook and etextbook are published under ISBN 0134261925 and 9780134261928. 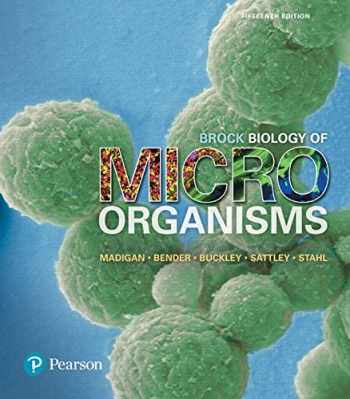 Since then Brock Biology of Microorganisms textbook received total rating of 4 stars and was available to sell back to BooksRun online for the top buyback price of $61.50 or rent at the marketplace. For courses in General Microbiology. A streamlined approach to master microbiology Brock Biology of Microorganisms is the leading majors microbiology text on the market. It sets the standard for impeccable scholarship, accuracy, and strong coverage of ecology, evolution, and metabolism. The 15th edition seamlessly integrates the most current science, paying particular attention to molecular biology and the genomic revolution. It introduces a flexible, more streamlined organization with a consistent level of detail and comprehensive art program. Brock Biology of Microorganisms helps students quickly master concepts, both in and outside the classroom, through personalized learning, engaging activities to improve problem solving skills, and superior art and animations with Mastering™ Microbiology. Also available with Mastering Microbiology. Mastering™ Microbiology is an online homework, tutorial, and assessment product designed to improve results by helping students quickly master concepts. Students benefit from self-paced tutorials that feature personalized wrong-answer feedback and hints that emulate the office-hour experience and help keep students on track. With a wide range of interactive, engaging, and assignable activities, students are encouraged to actively learn and retain tough course concepts. Students, if interested in purchasing this title with Mastering Microbiology, ask your instructor for the correct package ISBN and Course ID. Instructors, contact your Pearson representative for more information. Note: You are purchasing a standalone product; Mastering™ Microbiology does not come packaged with this content. Students, if interested in purchasing this title with Mastering Microbiology, ask your instructor for the correct package ISBN and Course ID. Instructors, contact your Pearson representative for more information. If you would like to purchase both the physical text and Mastering Microbiology, search for: 0134268660 / 9780134268668 Brock Biology of Microorganisms Plus Mastering Microbiology with eText -- Access Card Package, 15/e Package consists of: 0134261925 / 9780134261928 Brock Biology of Microorganisms 0134603974 / 9780134603971 Mastering Microbiology with Pearson eText -- Standalone Access Card -- for Brock Biology of Microorganisms, 15/e MasteringMicrobiology should only be purchased when required by an instructor.